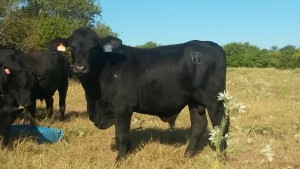 This attractive yearling bull is the full brother to a heifer that was purchased by Draggin’ M Ranch at last years TBBA Miss America sale. He is out of a Bright Side dam and sired by the amazing CRC GUARDIAN 9U8U5. He posts a great set of EPD’s with top 3% CEM, top 4% SC, top 10% FT, top 15% WW, YW, and REA, top 20% TM, and top 40% IMF. That’s 8 EPD’s better than average with great growth getting you more pounds by weaning. Whether you’re looking for a registered herd sire or a great bull for your commercial herd, he will fit your program. Taken on 9/2/2015 at 17 months of age.